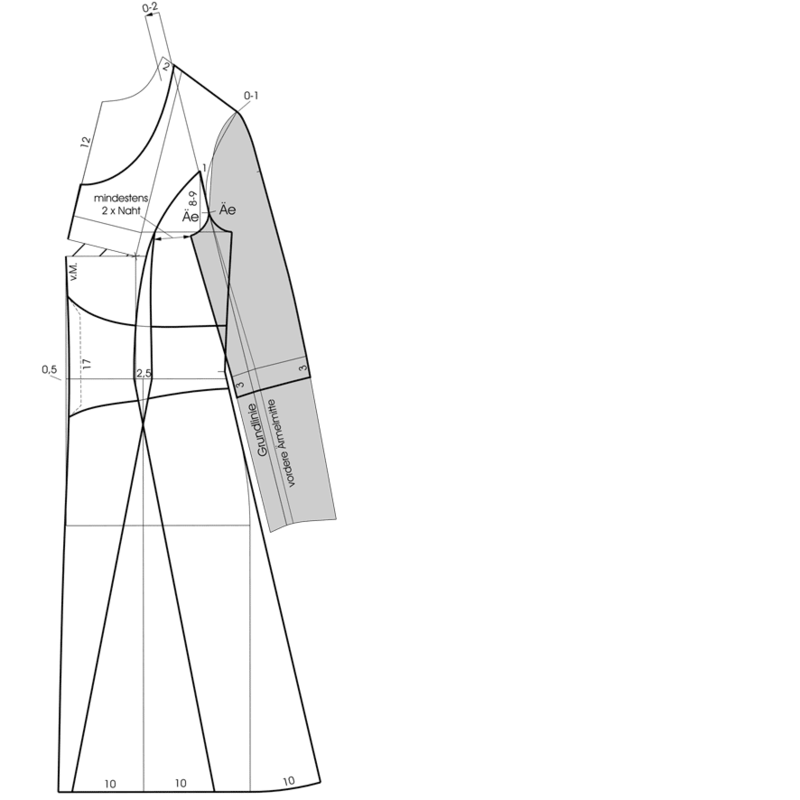 Use a basic dress block in size 40 (see measurement chart) and a matching one-piece sleeve pattern as templates. Set the length 58 cm below the waist. Relocate the bust dart temporarily to the centre front. Prepare the sleeve pattern for the sleeve-bodice combination. Mark the baseline on the front sleeve pattern and extend it approx. 20-25 cm upward. Measure 2 cm to the left at the upper end and draw a short, parallel line. The distance between the baseline and the auxiliary line (0-2cm) serves as a guideline for the raglan sleeve position. The neck point of the front pattern has to be placed between the baseline and the 2-cmline. Place the front pattern on the front sleeve with the front armhole notches touching. Turn the front pattern so that the neck point is placed between the extended baseline and the 2-cm line. Lower the neckline 2 cm at the shoulder and 12 cm at the centre front. Draw the new neckline as shown in the illustration. Draw the princess seamline 1 cm away from the waist dart line. Mark 2.5 cm intake at the waist for contouring the seamline. Draw the princess seamline to the armhole approximately 8-9 cm above the chestline and end about 1 cm away from the basic armhole. Draw the armhole and sleeve curve from the front armhole notch to the princess seam. Important: The minimum distance between the sleeve and the princess seam must be at least twice as wide as the seam allowance. Lengthen the side panel seam to the hemline. Extend the hem at the side panel seam and at the sideseam as shown in the illustration. Set the sleeve length 3 cm below the elbow line. Draw the stylelines for the lace appliqué. Place the back sleeve on the back pattern with the back armhole notches touching. Turn the sleeve so that it is placed with the same distance to the shoulder as in the front. 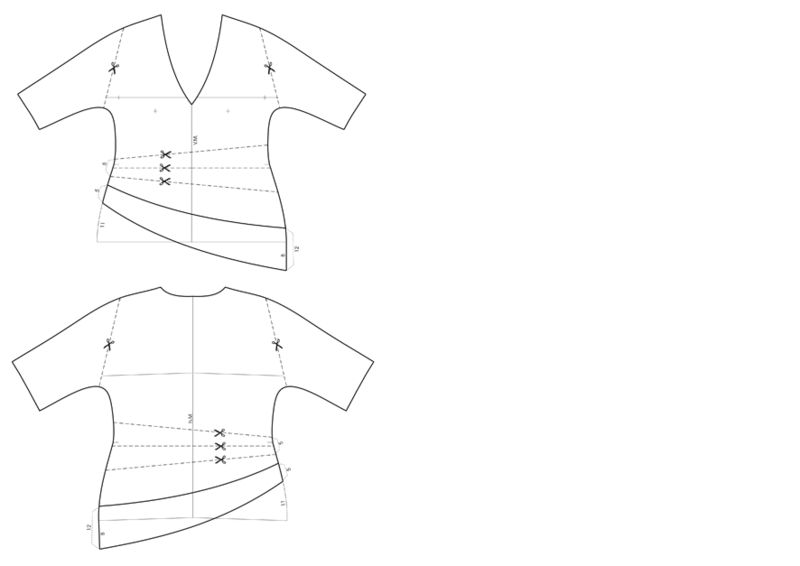 Draw the seamline from the shoulder to the overarm seam. Lower the neckline 2 cm at the shoulder and at the centre back. Draw the new neckline perpendicular to the centre back. Draw the princess seamline 8.5 cm away from the centre back. 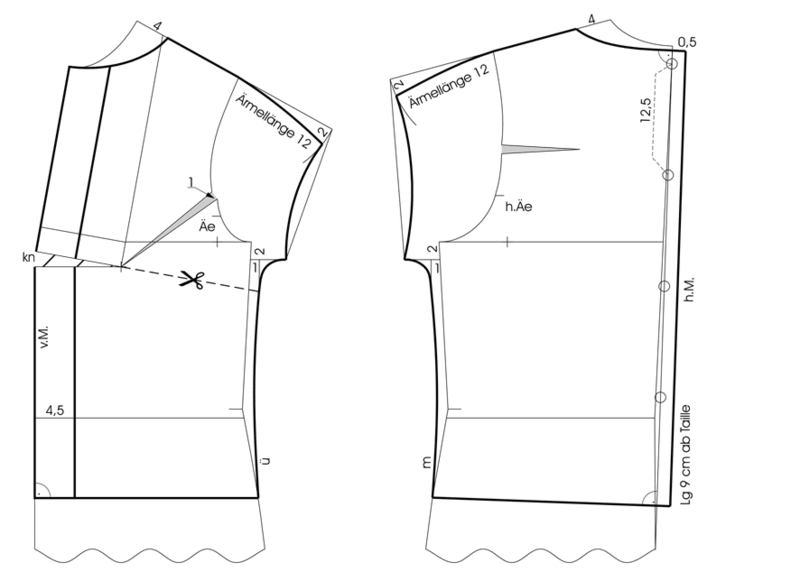 Draw the princess seam to the armhole approximately 8-9 cm above the chestline and end 0.5 – 1 cm away from the basic armhole. Mark 3 cm intake at the waist for contouring the seamline. Draw the armhole and sleeve curve from the back armhole notch to the princess seam. Important: The minimum distance between the sleeve and the princess seam must be at least twice as wide as the seam allowance. Lengthen the side panel seam to the hemline. Extend the hem at the side panel seam and at the sideseam as shown in the illustration. Set the sleeve length 3 cm below the elbow line. 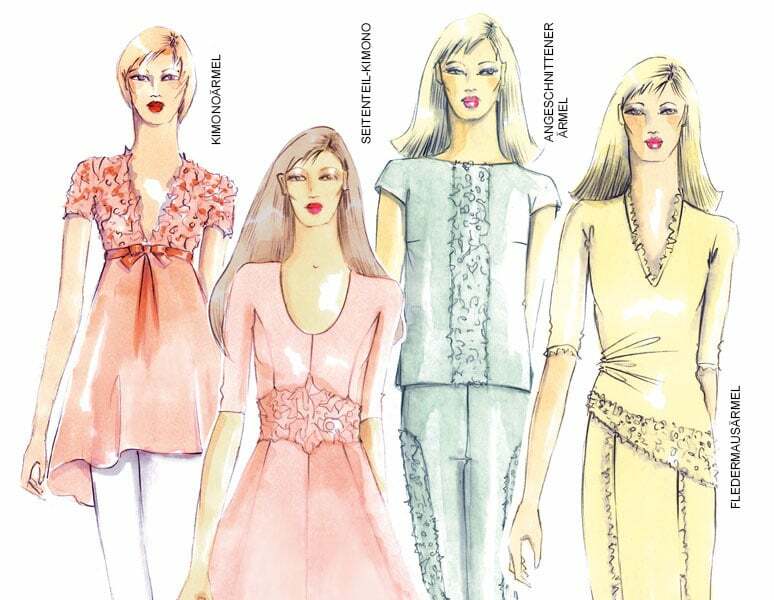 Draw the stylelines for the lace appliqué. Trace the pattern pieces and join the lower parts together at the side panel seams. 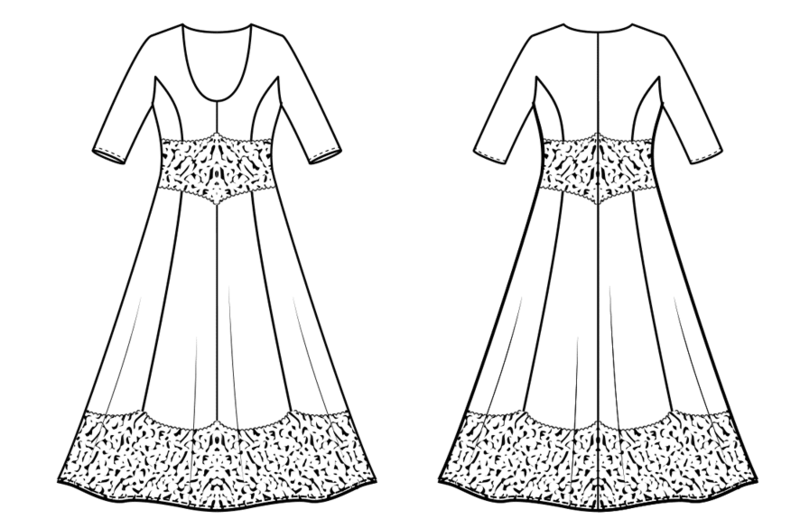 Blend the hemline and draw the stylelines for the lace appliqué as shown in the illustration. Trace all pattern pieces and complete all overlapping sections. Cut through the front pattern from the side panel seam to the bust point and close the bust dart. Blend the seamline. Close the waist darts on the lace pattern pieces. The lace is custom-made according to the pattern shape and then basted on the dress. Sew a zipper in the centre back seam. Blend all seamlines. Mark the grainlines. 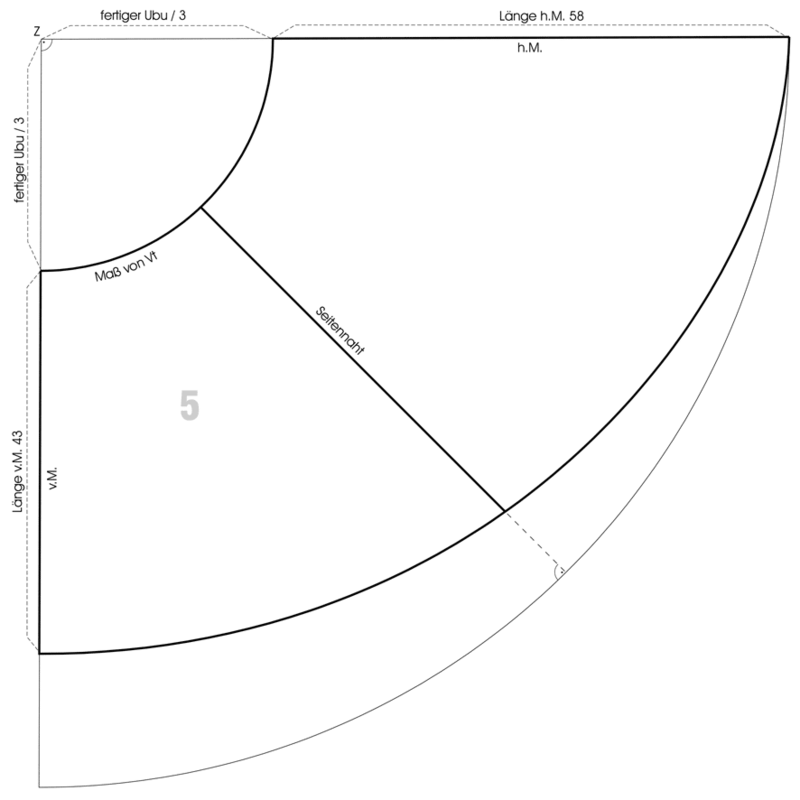 Use the basic dress block in size 40 as a template for the pattern development. Set the length 9 cm below the waist. Draw the centre back straight. Draw the hemline perpendicular to the new centre back. Open the armhole 1.5 cm on the front pattern. Leave the back dart in the armhole to extend the back armhole. Relocate the bust dart temporarily to the centre front. Lower the neckline 4 cm at the shoulder and 0.5 cm at the centre back. Draw the new neckline. Lengthen the shoulder seam 12 cm for the short Kimono sleeve. Lower the armhole 2 cm and extend the sideseam 1 cm. 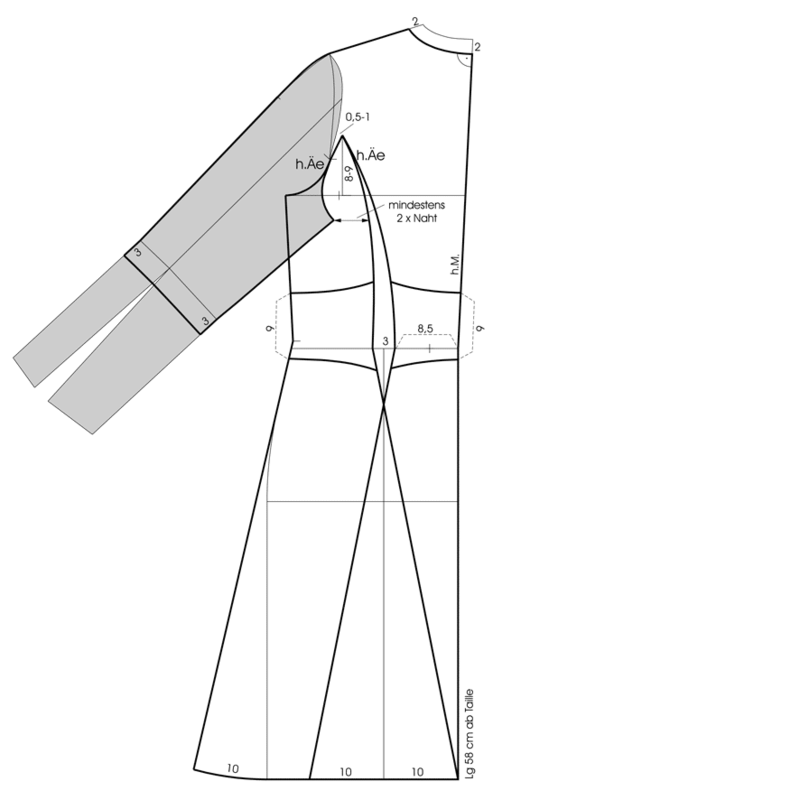 Draw a short line perpendicular to the extended sideseam and measure 3 cm for the lower sleeve length. Draw the guidelines for the sleeve hem and measure 2 cm from the upper sleeve length downward. 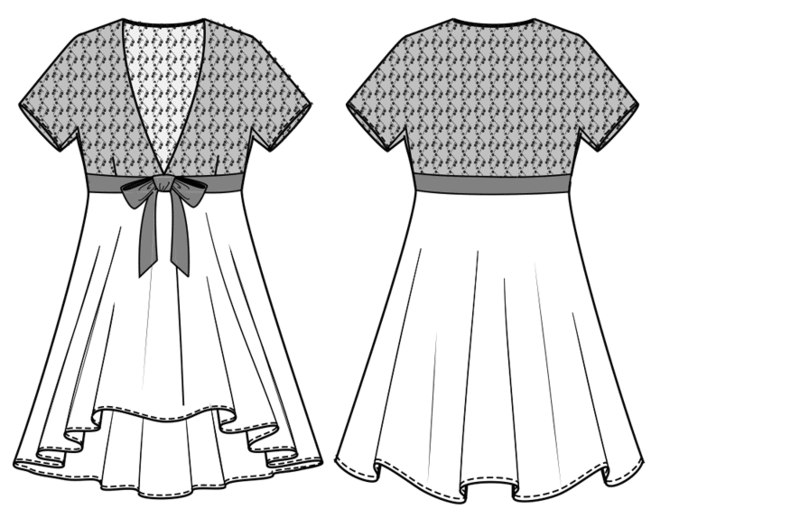 Draw the overarm seam and the hemline on the front and back pattern as shown in the illustration. Shape the sideseam. Add the overlap for the buttonstand parallel to the centre back and mark the button positions. Draw the seamline for the lace inset 4.5 cm away from the centre front. Separate all pattern pieces. Relocate the bust dart to the sideseam and shorten the dart. Add the grown-on facing to the centre back. Mark the grainlines. 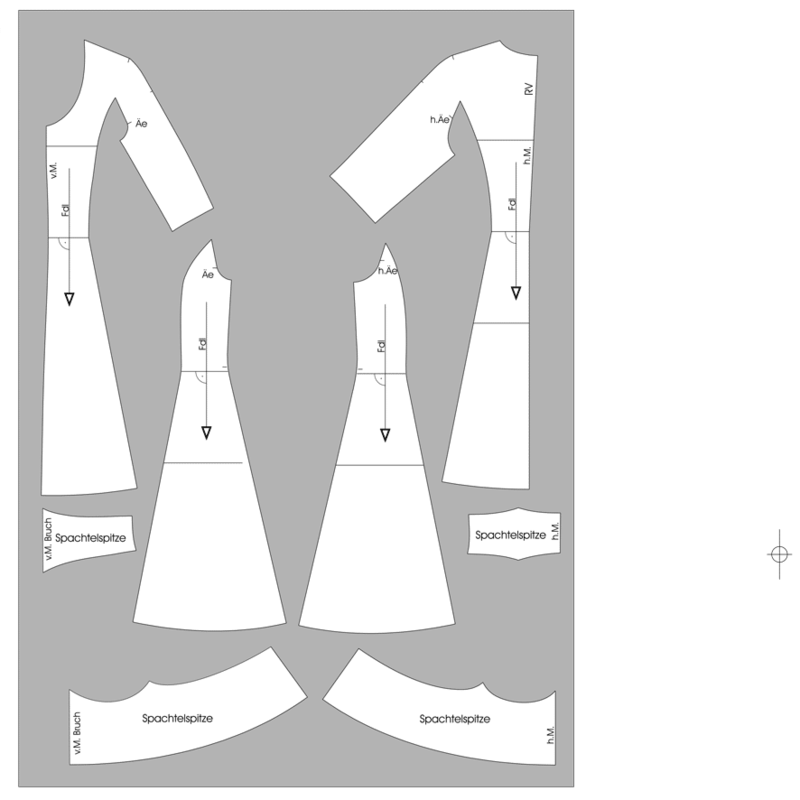 Use the basic dress block in size 40 and the matching one-piece sleeve pattern as templates. Taper the basic pattern 2 cm at the waist for each sideseam. Open the front armhole 1.5 cm. The back dart intake remains on the back pattern to extend the back armhole. To determine the front gusset corner (v.K.) draw a guideline (dashed) from the front armhole notch to the raised waist point at the sideseam. The guideline for the back gusset corner (h.K.) begins 1 cm besides the back armhole notch, so that the back gusset corner is not placed too far in the back pattern. Since the back pattern already contains 2⁄3 of the armhole, the back gusset corner is positioned already more to the back. Draw a vertical and a horizontal line to determine the gusset corners in the front and back sleeve. Mark the intersection of both lines as point S. From the crossing point S square the front gusset width (S-v.K.) to the left and the back gusset width (S-h.K.) to the right. 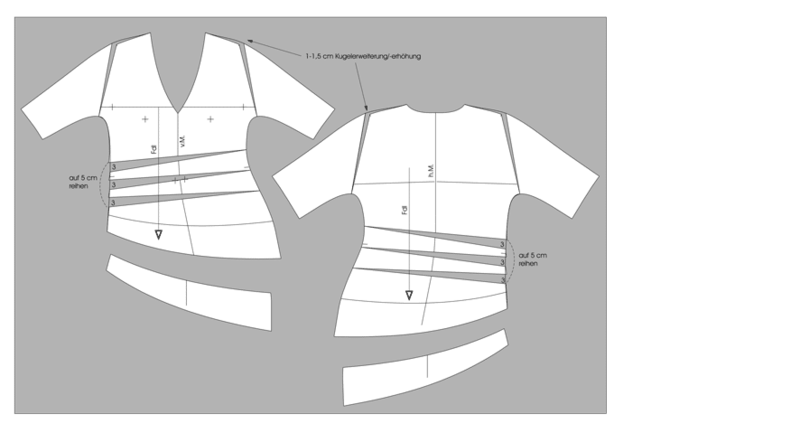 Measure 20 cm upward from point S, square 2 cm to the left and draw a line to the crossing point S. Place the sleeve pieces on the vertical line up to the elbow line with the sleeve seams touching point S. Transfer the front gusset width (S-v.K.) to the front sleeve and the back gusset width (Sh. K.) to the back sleeve. Place the front sleeve on the front pattern with the front gusset corners touching. Turn and open the sleeve so that the sleeve cap is placed 1 cm within the shoulder seam. Cut through the back sleeve from the sleeve cap to the elbow line. Place the back sleeve on the back pattern with the back gusset corners touching. Turn and open the sleeve so that the sleeve cap is placed 1 cm within the shoulder seam. Blend the shoulder and the overarm seam. Set the sleeve length with 7 cm at the sleeve seam and draw the sleeve hem. 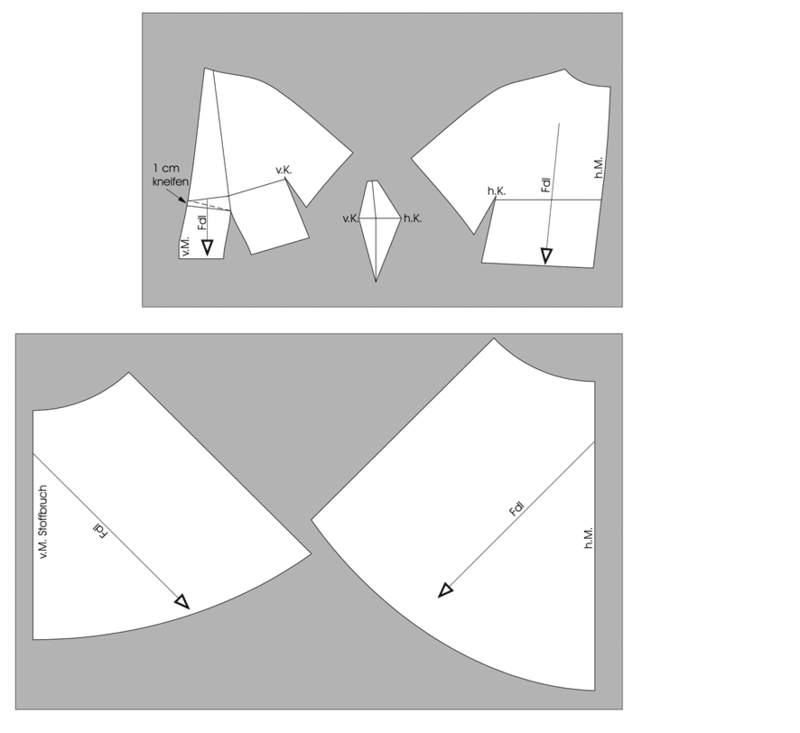 Draw the seamlines for the diamond gusset from the front and back gusset corners (v.K. and h.K.) 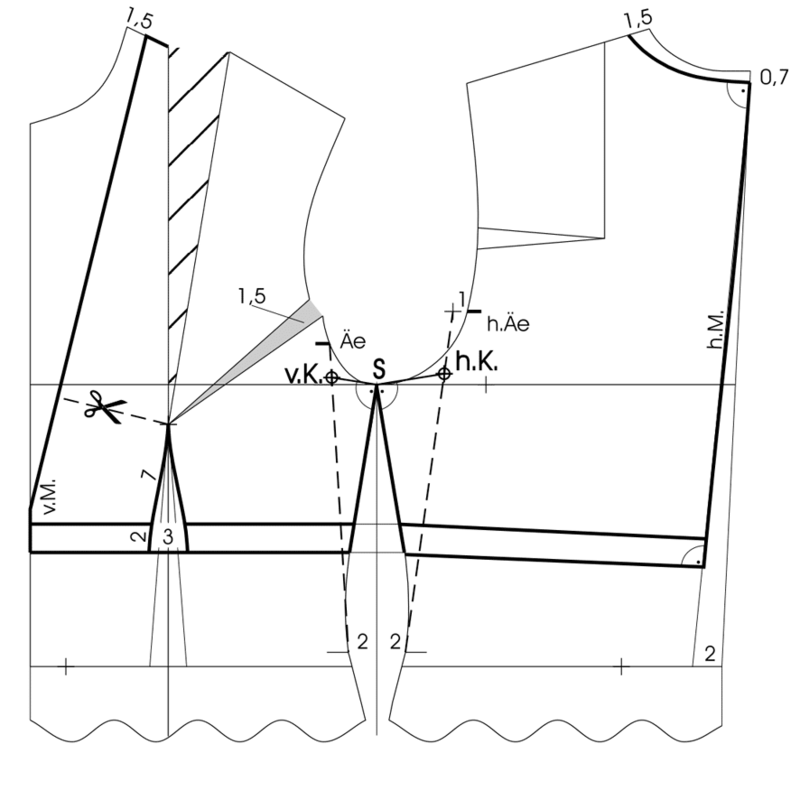 to the underbust seam on the front and back pattern (gusset point K1). 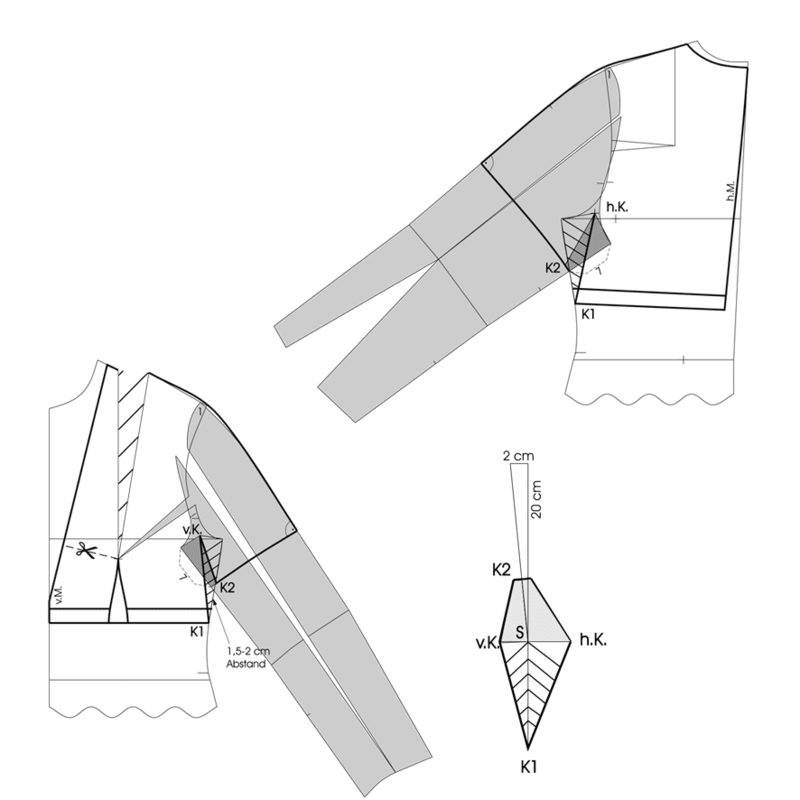 Draw the gusset seamlines to the sleeve hem (gusset point K2) on the sleeve patterns. There must be at least 1.5 – 2 cm distance between the two gusset points K1 and K2 for the seam allowances. There are two pieces for the diamond shaped gusset each on the front and back sleeve-bodice combinations. For a better overview, the gusset pieces of the front and back patterns show hatched markings and the gusset pieces of the sleeves are marked in grey. Copy the gusset pieces and place them on the vertical and horizontal construction as follows. Finish the diamond gusset pattern by placing the gusset pieces on the vertical and horizontal lines. Copy the gusset pieces from the front and back pattern. Place the hatched pieces with the sideseams on the lower vertical line with the front and back gusset corners (v.K. and h.K.) matching. The gusset pieces touch at point K1. Place the copied sleeve gusset pieces (here grey) on the diagonal line with the sleeve seams touching and the front and back gusset corners (v.K. and h.K.) matching. The gusset pieces touch at point K2. For a better sleeve fall, the gusset is shifted slightly to the front by placing the pieces on the diagonal guideline. 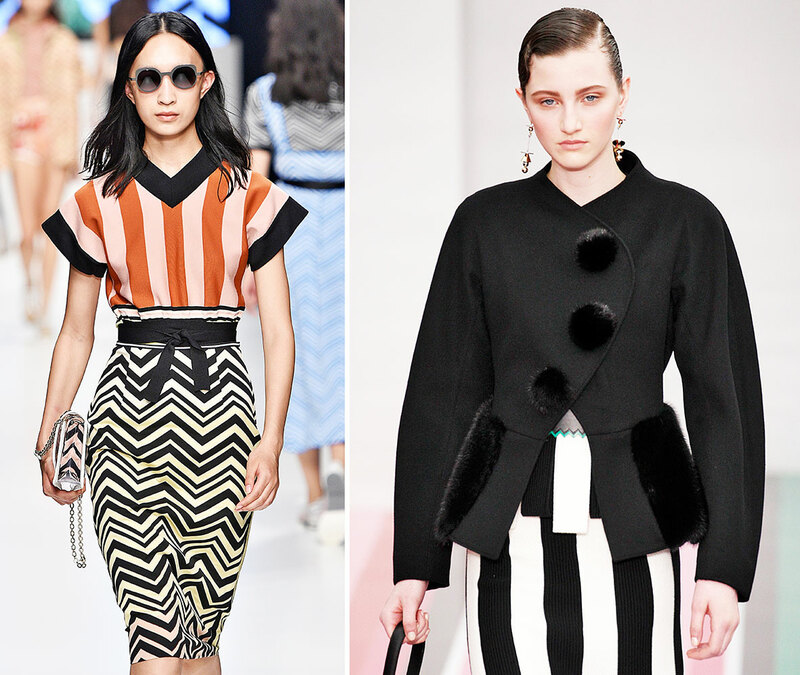 Draw the tunic skirt pattern on a circular arc. 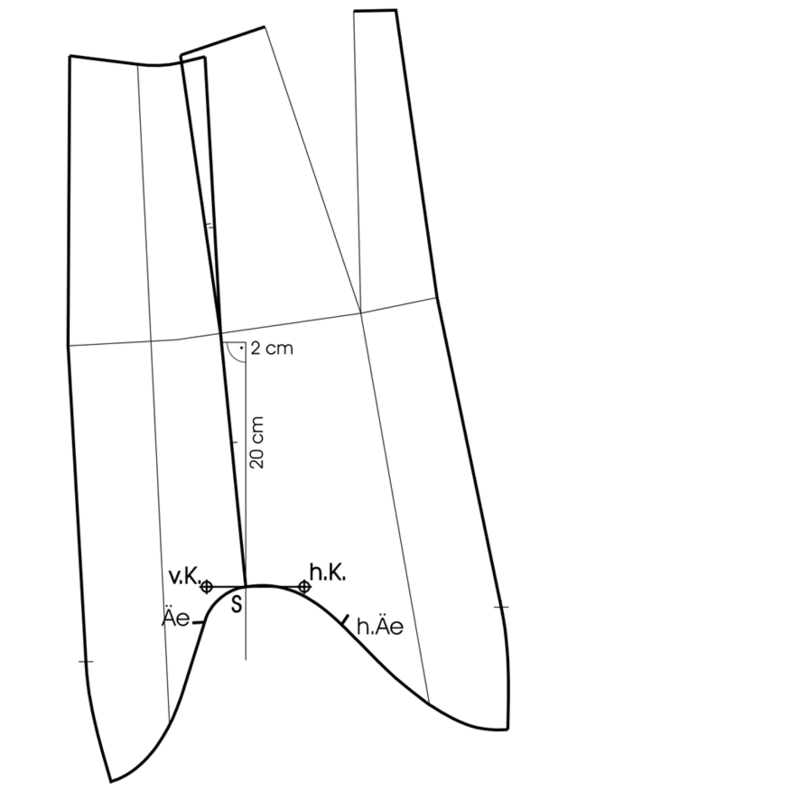 Measure the finished length of the underbust seam. Calculate the radius of the circular skirt with one third of the total underbust girth. Draw a quarter circle with pivot point Z. Set the length with 58 cm and draw another circular arc. Mark the length at the centre front with 43 cm. Draw the hemline according to the illustration. Transfer the position of the sideseam from the front pattern. Copy all pattern pieces. Close the bust dart and take in 1 cm at the neckline for contouring. Sew the zipper in the centre back. Mark the grainlines. Use the basic dress block in size 40 and the matching one-piece sleeve pattern as templates. Mark the length temporary up to the hipline. Taper the waist 2.5 cm at each sideseam. The front length is slightly reduced for this Jersey top. Cut through the front pattern from the centre front to the bust point and to the armhole. Overlap the pattern 1 cm at the bust and open the armhole 2.5 cm. The bust dart closes at the same time. The back dart intake remains on the back pattern to extend the back armhole. Then place the front sleeve on the front pattern with 0.5 cm sleeve cap and 2 cm distance between the side seam and the sleeve. Raise the shoulder seam and draw the new overarm seam. 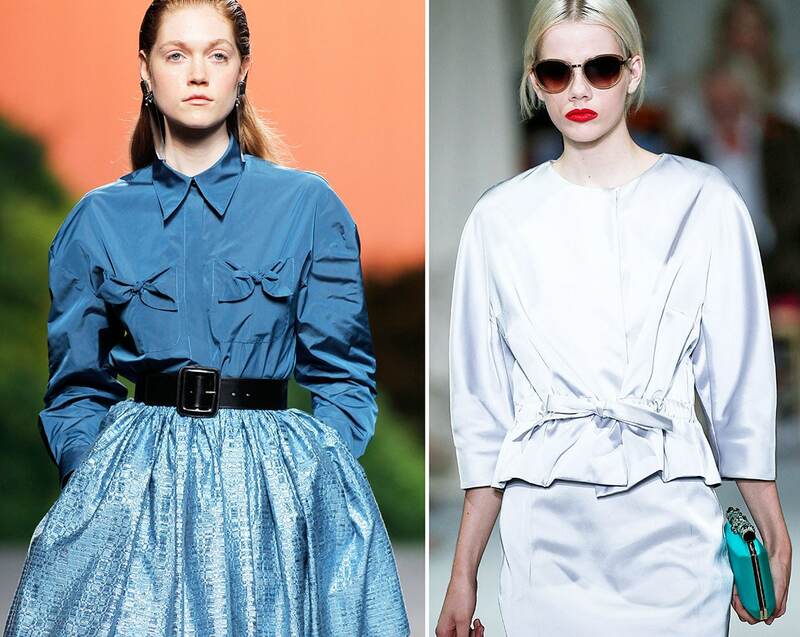 Measure the distance between the waist and the sleeve hem. Place the back sleeve on the back pattern with the same sleeve cap reduction. 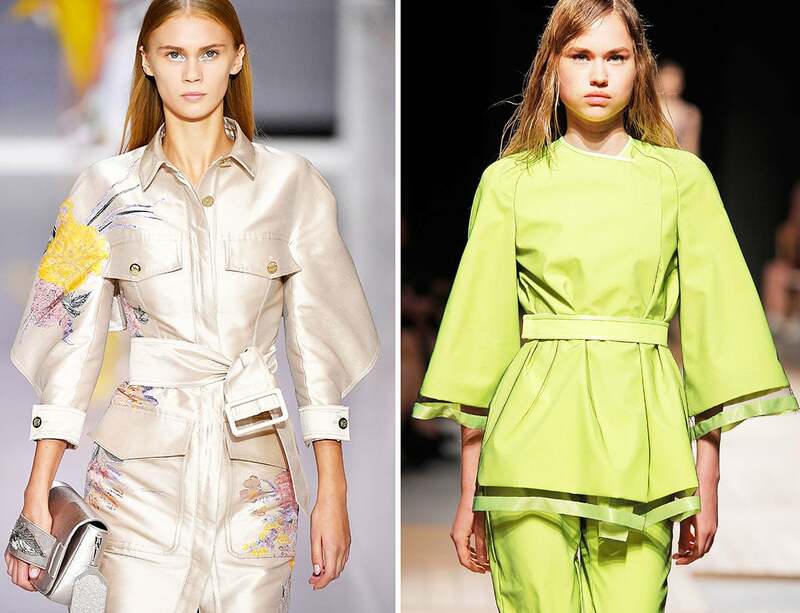 Measure the distance between the waist and the sleeve hem on the front sleeve-bodice combination. Transfer this measurement to the back pattern: Draw a circular arc with pivot point at the raised waist point. 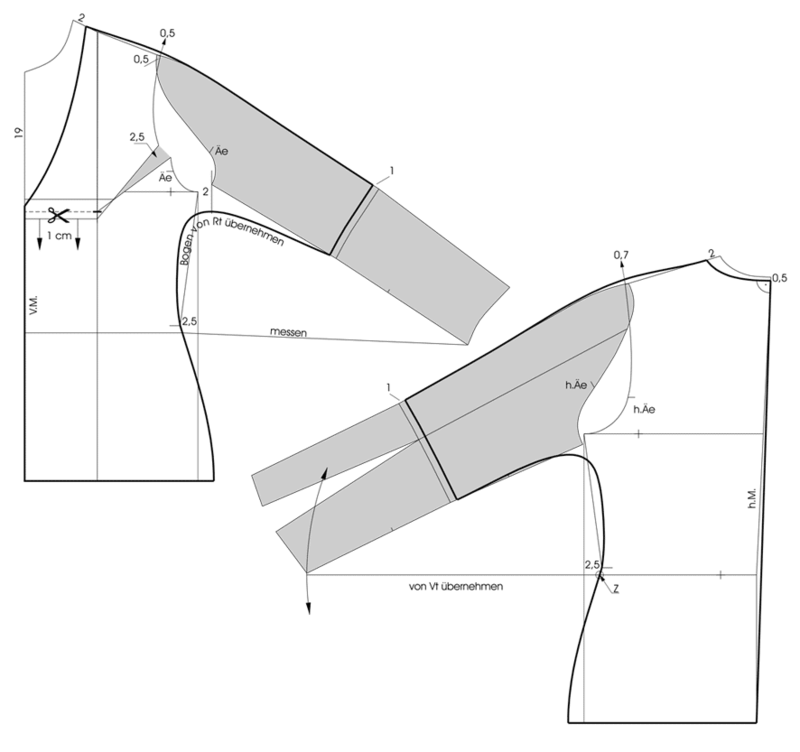 Then place the back sleeve on the back pattern with the same sleeve cap and the sleeve hem touching the circular arc as shown in the illustration. Draw the new overarm seam. Raise the shoulder seam and draw the new overarm seam. Draw the centre back straight for cutting the back pattern on the fabric fold. Lower the neckline 2 cm at the shoulder and 0.5 cm at the centre back. Lower the neckline 19 cm at the centre front and draw the neckline according to the illustration. 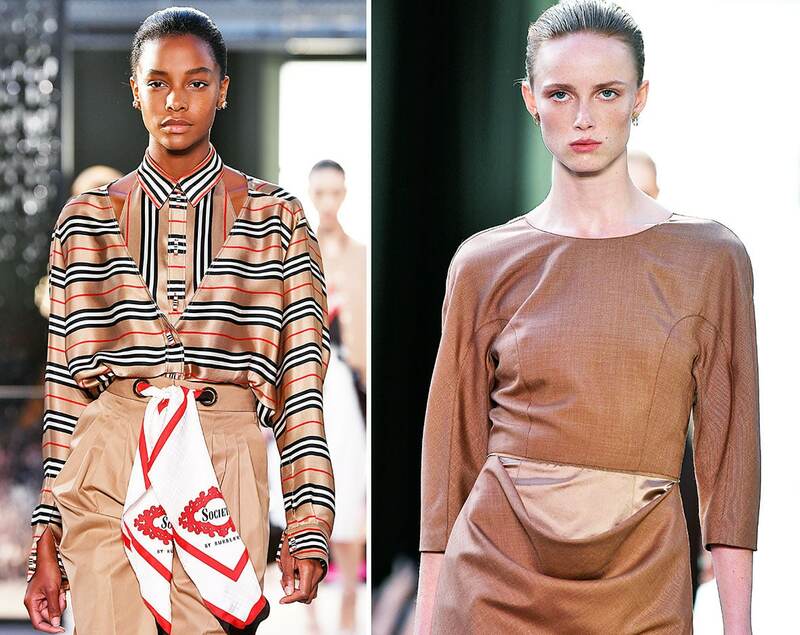 Set the sleeve length 1 cm above the elbow line. Draw the underarm seam first on the back pattern and then transfer it to the front pattern. Cut out the back pattern and trace the mirrored underarm seam. Blend the seamlines. Copy the front and back pattern and mirror both patterns over the centre lines. Draw the asymmetrical hemline and the lace facing according to the illustration. Mark three cutting lines on the front and back pattern for the draped sideseam. Mark cutting lines from the shoulder points to the underarm seams for the sleeve cap extension and rise. Copy the lace facing pattern from the front and back pattern. Slash and spread the front and back pattern 3 x 3 cm at the sideseam. Gather the draping to 5 cm. Slash and spread the sleeve cap and draw the new overarm seam.